Those who’ve been reading for a while know that I’m a sucker for a good iris note, and that I’ll try basically anything Hermes puts out. 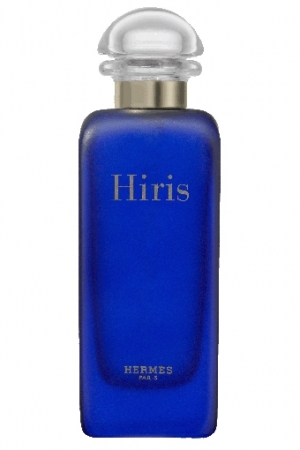 So it was inevitable that I’d eventually review Hiris, from 1999. Like most by Hermes, it’s not inexpensive by any means, but it’s not as obscene as, say, a Bond No. 9 or an Amouage. The perfumer who worked on it, Olivia Giacobetti, also did L’Artisan’s Jour de Fete, which I quite enjoyed. As one would expect, Hiris is, obviously, all about the iris. It’s in the top notes along with some coriander and carnation to give it that 90s spicy-floral thing, along with some amber for smoothness. Then it appears again in the heart, with rose and a hint of orange blossom. The only thing I dislike about this is that I’m really disappointed in how the base plays out. Five hours in, this gorgeous, upscale powder heaven morphs into Jeanne Arthes Love Generation Rock, which I found disappointing even for a $10 drugstore thing. It’s the way the vanilla in the base plays off the woods around it that I don’t quite like, and while other people are talking about a prominent honey note in the base of Hiris, it doesn’t come out to play at all on me. In terms of performance, it’s fantastic. The projection is just how I like it, and unlike other Hermes scents I’ve tried, it hangs on all day. I think this could be a love if the finish weren’t so disappointing. As it is, I’ll probably finish my decant at some point, but I doubt I’ll buy a bottle.